President Obama’s decision to cancel his trip to the Pacific Rim economic summit because of the political battle at home over the budget and debt ceiling comes against the backdrop of his administration’s strategy to “pivot” U.S. attention back to Asia after years of being embroiled in conflicts elsewhere in the world, like Iraq and Afghanistan, that had been the focus of American attention. When it comes to the superpower competition, publics in the three countries Obama was to visit still don’t see China as overtaking the U.S. 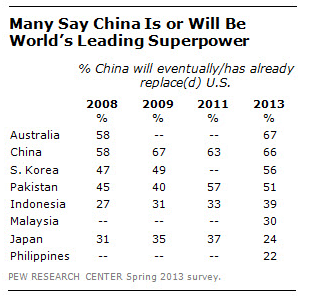 While a Pew Research Center survey of 39 nations this spring found that many publics around the world believe the global balance of power was shifting to China, that was a minority view in Indonesia where just 39% said China would or had already replaced the U.S. as the leading superpower, and in Malaysia (30%) and the Philippines (22%). 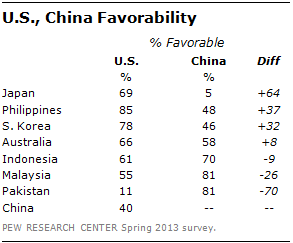 In Japan, which was not on Obama’s itinerary, just 24% saw China as replacing the U.S. as the leading superpower. However, about half or more of publics in four other countries in the region included in the survey believe China has or will become the leading superpower: Australia (67%), China itself (66%), South Korea (56%) and Pakistan (51%). Across the seven countries in the region that were surveyed, publics generally have a more favorable view of the U.S. compared to China.. But there were sharp variations among the countries. In Japan, a traditional U.S. ally which is engaged in territorial disputes with China, 69% saw the U.S favorably compared to only 5% for China. The U.S. image was 37 percentage points more favorable than that of China in the Philippines, 32 points higher in South Korea and 8 points more positive in Australia. That was not the case in three countries surveyed: publics in Indonesia saw China more favorably by 9 percentage points, Malaysians regarded China more favorably by 26 points and Pakistanis’ view of China was more favorable by 70 points. Both the U.S. and China get mixed reviews when publics in the region are asked how much each country considers the interests of their own nation, although, on balance, China fares somewhat better on this measure. 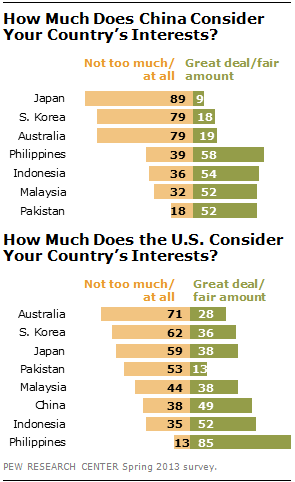 About half or more in the Philippines (58%), Indonesia (54%), Malaysia (52%) and Pakistan (52%) say China considers their country’s interests a great deal or a fair amount; big majorities in Japan (89%), South Korea (79%) and Australia (79%) disagree — saying that China takes their countries’ interests into account not too much or at all. The only country in the region where a clear majority says the U.S. takes their interests into account a great deal or fair amount is the Philippines (85%). About half (52%) of Indonesians share that view. A big majority in Australia (71%), which was one of the countries that was part of the administration’s “pivot” strategy, says the U.S. does not take its interests into account much or at all while more than half of publics in South Korea (62%), Japan (59%) and Pakistan (53%) share that view. Opinion is divided in Malaysia where the public says the U.S. does not consider its interests much or at all by a 44% to 38% margin. The U.S. does better in China itself where 49% says the U.S. considers their country’s interest a great deal or fair amount while 38% hold that opposite view. While views vary in the region on whether China acts too unilaterally in foreign affairs, its growing military power has caused concern among its Asian-Pacific neighbors. About seven-in-ten or more in Japan, South Korea, Australia and the Philippines regard China’s increasing military might as a bad thing, with that view held by 96% in Japan and 91% in South Korea. 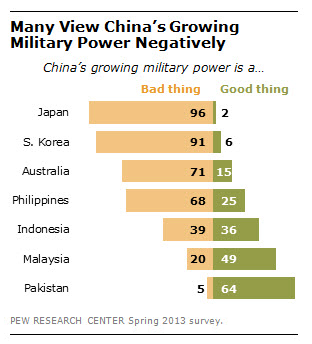 There is less concern in Pakistan (5%), Malaysia (20%), and Indonesia (39%), although the number of people in those countries who see China’s military power as a positive thing is down from previous surveys. Another source of tensions with China has been territorial disputes in the region, particularly the face-off between Japan and China over control of several small uninhabited islands in the East China Sea. There is also a standoff between China and the Philippines over the Scarborough Shoal in the South China Sea. Strong majorities in the Philippines (90%), Japan (82%), South Korea (77%) and Indonesia (62%) think that such territorial disputes with China are a big problem for their country. Despite what negative views of China may exist in several countries of the region, none of the Asian countries surveyed had a majority of people who saw China as an enemy. 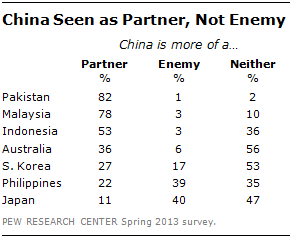 The Japanese had the highest number of those seeing China as an enemy (40%) followed by the Philippines (39%). But majorities in seven nations responded that China was either a partner or neither partner or enemy.